This salad makes a great dinner, is easy and quick to make and isn’t expensive. Put watercress in bowl. Peel prawns, do not remove tails. Cut chilli peppers in quarters, garlic in small slices. Chop parsley, coriander and basil. Heat two frying pans – one larger for prawns and one smaller for cashew nuts. Put half a spoon coconut oil in bigger pan, wait until oil is heated. Add prawns, chilli peppers and garlic. Fry for about 3 minutes. Add pepper and salt. Heat up the smaller pan and add cashew nuts once pan is hot. Roast until nuts turn golden brown. 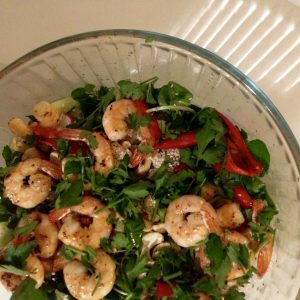 Add prawns to salad. Top with cashews, parsley, basil and coriander. Sprinkle sesame seeds, add some sesame oil. © FitnessArtz 2016. All Rights Reserved.